Alice has been a Leadership Trainer, Executive and Life Coach since 2005. She specializes in building leadership capacity and personal effectiveness. With her wealth of experience, she has established a reputation for bringing forth the commitment of clients with effective strategies to unlock their full potential. Alice has a gift for establishing close rapport with people within a short time through open and honest conversations. 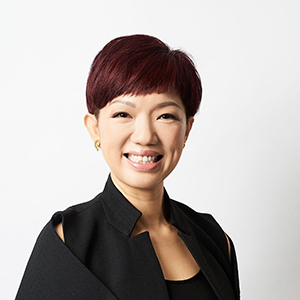 Alice has worked with a diverse range of coaching clients around Asia, in both public and private sectors, at the executive and board levels. Her clients include Design Link Architects, ELS Defense Equipment, PETRONAS, Aditya Birla Group, Acxiom, The Thought Collective, Body Contours and HSBC Insurance, INTI/Laureate International University & College and government ministries in Singapore. Alice holds an Honours degree in Chinese Language and Linguistics with a Diploma in Education. She is a PCC level certified coach with the International Coaching Federation, a certified NLP Practitioner and a Newfield Certified Ontological Coach. She is also certified to lead David Bercelli’s Tension Release Exercises (TRE). In her personal life, Alice is married with 3 boys and loves to spend time enjoying her children’s journey out into the world. She is also an epicurean who indulges in gourmet experiences. Alice is fluent in both English and Mandarin.